For regular updates about our rescue work, please follow us on Facebook. The collection and publication of this data is sponsored by Maddie's Fund®. Adopters sometimes say jokingly that in New York City it's harder to adopt a cat than a child. Because our first responsibility is to the animals in our care, there is an application and interview process. Our goal is a provide our rescued animals with lifelong (perhaps 20 years) loving, stable, indoor homes. Our adoption process is similar to that of other animal rescue/adoption groups. Like Bide-A-Wee, CACC, the ASPCA and The Humane Society, we ask for references and identification and ask adopters to sign an adoption agreement. We deliver the animals to their new homes at a time of mutual convenience. Because we deliver the animal to your home, we prefer to adopt to homes within our immediate area. If there is already a pet in the home, we will help with the introduction. We are available at any time to discuss your questions and any adjustment problems the cat may have. We ask that you give the cat a reasonable time to settle in, but if the adoption doesn't work out, we will take the animal back and continue to work to place it in an excellent home. Like many animal adoption and rescue organizations, we usually try to place kittens, young cats and older cats who enjoy cat company in pairs or in situations where there is already another cat. We always have a number of adult cats who can or must be adopted singly. We always need foster homes for cats, kittens, and sometimes dogs who are awaiting adoption. Fostering means that you care for a animal in your home while we actively search for a permanent home for the fostered pet. We provide any veterinary care the animal might need. You pay for supplies such as pet food and litter. You should be within reasonable distance of our Adoption Center in the Turtle Bay PetCo (991 2nd Ave, between 52nd and 53rd.) 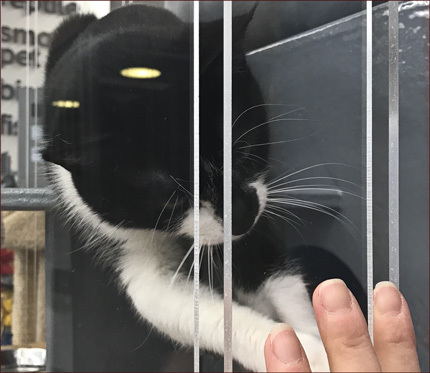 or our PetSmart adoption location at 1107 Broadway (between 24th and 25th), so that your fostered animal can be shown for adoption on weekends (when appropriate). You fill out the same application that you would to adopt. You should be a responsible, caring person, and knowledgeable about animals. Other requirements include a safe environment and the consent and support of any other household members. Long term fosters are for those animals who are not immediately adoptable: a mother cat with a newborn litter of kittens, kittens who are too young for adoption, shy cats and kittens who need to be socialized, animals with a temporary medical condition (such as an upper respiratory infection, recovery from surgery, or poor condition due to past neglect). Short term fosters involve animals who are immediately adoptable, who often need less than a month of foster care. 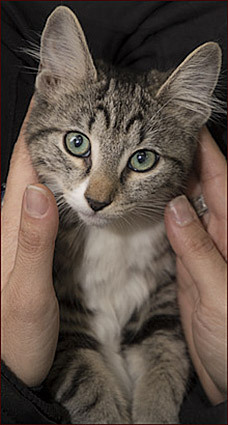 You usually have first option to adopt your fostered animal. We reserve the right to approve the adoption of the fostered pet and to follow the normal adoption procedure. City Critters is now registered with AmazonSmile. When you shop at Amazon using the Smile link, Amazon will donate a portion of the purchase price to City Critters. You can see some of our cats and older kittens in our adoption areas in PetSmart at 632 Broadway (between Bleecker and Houston) and in the Turtle Bay PetCo, 52nd St. and 2nd Ave. They can be visited anytime during store hours. Younger kittens (and sometimes dogs) are shown on weekends. Most of our animals are listed on Petfinder.